Another winter storm? Yikes! More snow! More wind! More single digit temps! If you can believe me, (and you can, dear friend), we are actually pulling for more winter snow here. Our son is hoping for major inches (a.k.a. “No School”). Our dog, Teddy, an inside dog who loves the cold, would be ecstatic if permitted to snuffle around in more snow. My husband and I agree it would only make watching the Olympics more realistic! Beyond our hopes, we also are physically prepared. Indoors, all food groups have been represented thanks to an expedition to the nearby densely-packed grocery. Now–home with the bounty–bread, canned soup, canned fruit, and cereal fill our pantry shelves. There’s also plenty of tea and hot chocolate. Extra milk and cheese are in the refrigerator and meat and veggies are stockpiled in the freezer. We even have a supply of our own variety of vitamin C–chocolate! Outdoors, snow shovels and a broom are on stand-by, and my helpful husband has agreed to pick up a bag of snow-melt on his way home from work. We’ve also thought about entertainment–for both power and no power situations! Ipods and laptops are charged. 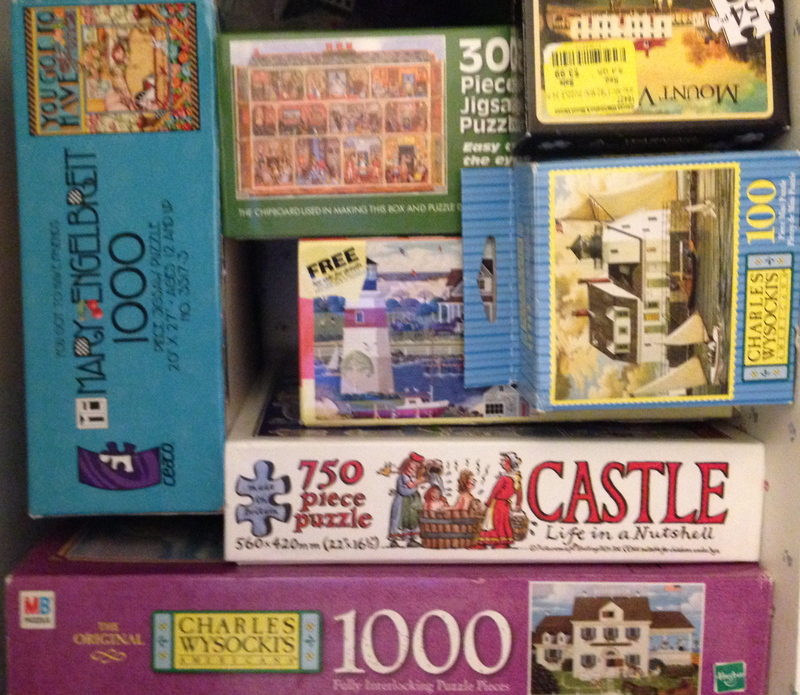 There are puzzles and games and books in abundance. if we’re willing to throw one of Teddy’s favorite toys, he is always up for racing down the hall chasing it. He has a bedraggled fox, an oddly mottled kitten (my husband insists it’s a panther–much fiercer), and his favorite–a mangy squirrel. 3 hours, and that includes a bath for Teddy. That’s not really a lot of preparation time, is it? Packing for a trip takes me longer! Preparing Thanksgiving dinner takes longer! And think of Noah. Now THAT was major storm preparation! Genesis chapters 7 through 9 tell the story of Noah, the flood, the ark, their safe deliverance, and God’s covenant. Reading through it, I’m struck by the repetition of the phrase, “And Noah did all that the Lord had commanded him.” Even though there was to do, It seems that the preparation wasn’t the main thing for Noah: obeying God was. I am always in awe of how God and His word can put life in perspective. Aren’t you? Sometimes life does not unfold according to our plans, does it? A traffic snarl makes meeting a friend for lunch an impossibility. A winter storm curtails a needed shopping trip. Even so, God in His ultimate sovereignty has everything under control. What we see as mass of conflicting schedules and competing needs God sees as a potential offering to Him. When we can take our day and begin it with praise and prayers to Him, then all that follows has the possibility of being an offering to HIm, a means of following His will in our lives. “Choose you this day whom you will serve.” (Joshua 24:15) Choose. Determine. Purpose. Decide. There is a commitment in there. We are called to serve God and to honor and reflect Christ all day long. I thought about this idea while attending to my mother when she was in rehab for her broken leg. How could I actively make a bad situation an opportunity to grow closer to God and to glorify Him and Christ, and spread Christ’s love in that predicament? James 1 tells us that we are to “consider it a great joy, my brothers, whenever you experience various trials, knowing that the testing of your faith produces endurance. But endurance must do its complete work, so that you may be mature and complete, lacking nothing.” I want to mature as a Christian, to be able to “run with endurance” the life God grants me. (Hebrews 12:1) You do, too, I’m sure of it~and here is good news! In James 1, God gives us a regimen! Away with flabby self-satisfaction and flimsy pride. Death to self pity, complaints, and demands. Let’s take our eyes off our broken selves, off our rattled circumstances and see everything in light of God’s sovereignty and grace. We start with a prescription: consider it a great joy. And those trials and testings? Well, that’s rehabilitation. These trials and testings have a heavenly purpose–to develop endurance in us and to make us mature and complete. Given my slow-learner status in many areas, that will be a life-long process, I’m sure! 2. Have food delivery numbers. Think outside the normal routine. 3. Never discourage visitors. Love them, encourage them, and bless them for coming. 4. Offer little treats. Chocolate or verbal–or both! 5. Start the day with praise. Give the day and all glory to God. Contemplate the prayer of Thomas a Kempis, “As Thou wilt; what Thou wilt; when Thou wilt.” Pray. Read scripture. 7. Be kind. Smile. Learn names. Ask questions. Offer understanding and hope in Christ. As I head off to get our little wagon serviced for a mileage checkup, I think these rehabilitation practices can go with me. There’s no telling what they’ll find and what trials I’ll fall into! I’m eager to do today’s rehab exercises in the world–on this day that God has planned for me. Hitting the “Publish Post” button and grabbing my coat and purse, I must also remember to bring along joy. I pray you are also full of joy as you go through your day, facing trials, and maturing in faith.